Vegan What??? : Olive, the other reindeer. In a large saute pan heat olive oil, add garlic and brown slightly. Add onion slices and tomatoes (keep tomatoes whole, sauce will be done when they start to burst). Heat through until tomatoes begin to burst, add Kalamata tapenade and blend well. 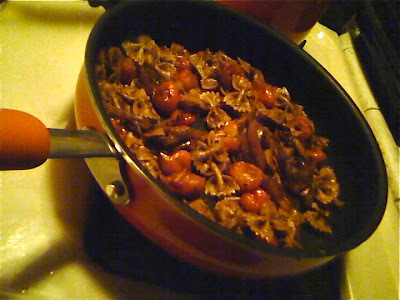 (I usually save about 1/2 cup of the pasta water and add it at this point, it makes the sauce saucier). After sauce has been well blended, add cooked pasta and stir to mix together, making sure to get all the good bits off the bottom of the saute pan. Sprinkle with freshly grated Parmesan cheese (if you like) and serve. For those of you have more time (I know, I know....this is not usually the case for anyone) here is the from scratch recipe for the tapenade. Combine all ingredients in blender or food processor. The from scratch recipe makes 4 servings. Hmmm...this recipe is not as enticing as the cupcakes, lol, but I LOVE your new pans!!! I love them too, and this recipe is pretty darn AMAZING!! But you have to like olives!